Between 1892 and 1910, the innovative Surgeon General of the Dutch Army, General De Mooy, developed an entire concept for medical evacuation, including ground vehicles, aircraft, dirigibles, and captive balloons pulled by horses. Unfortunately, this forward-looking concept, which earned him the sobriquet of "the Jules Verne of aviation medicine", was never tested or implemented. 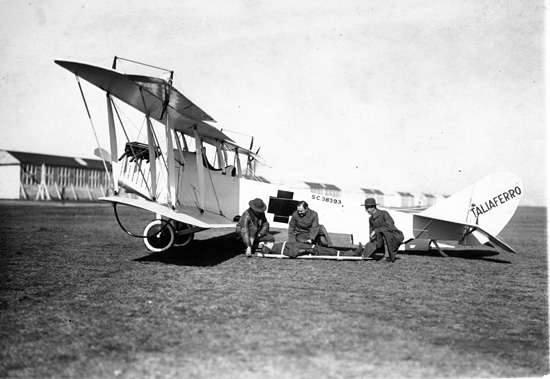 The first great step forward in the concept of aeromedical evacuation occurred in 1909, when Captain George Gossman, a U.S. Army medical officer, joined with Lieutenant Albert Rhodes of the Coast Artillery Corps in designing and building an aircraft specifically for the transport of patients. The aircraft, though crude and requiring the patient to lie unprotected on the wing alongside the pilot, was successfully flown (once! ), and Gossmann and Rhodes attempted to convince the War Department to develop the concept further. Since this proposal was made only a year after the Army purchased its first motor-driven ground ambulance, and in the same year in which the Army purchased its first aircraft (it was not to purchase another for two years), it may be imagined with what degree of success they met. In the face of War Department obstinance, numerous medical officers took up the battle for air evacuation. The response of the War Department echoed that of the newspaper, the Baltimore Sun, which proclaimed that "the hazard of being severely wounded was sufficient without the additional hazard of transportation by airplane." In France, too, military medical professionals faced opposition from the Ministry of War in attempting to develop an air evacuation capability, but the opposition of the conservatives was to be overridden by the force of circumstances. In November of 1915, during the retreat of the Serbian Army from Albania, it became impossible to evacuate all the sick and wounded of the French Expeditionary Force by ground, and it was unthinkable to abandon the wounded to capture. Therefore, although the only available aircraft were fighter aircraft in poor condition, the decision was made to attempt evacuation by air. 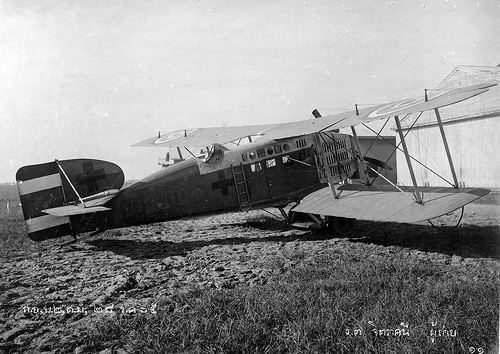 The first heavier-than-air evacuation in history took place on 15 November 1915, and over the succeeding month, 13 wounded were evacuated from frontline, poorly prepared airstrips, often within rifle shot of the enemy. Based on this dramatic evidence of the usefulness of air evacuation, as well as on the results of exercise trials, the French government authorized the development of the first air ambulances, which were first used in combat on the Aisne front in 1917. However, the risk of aircraft losses derailed this experiment, with one member of the Chamber of Deputies crying "Are there not enough dead in France today without killing our wounded in airplanes?" 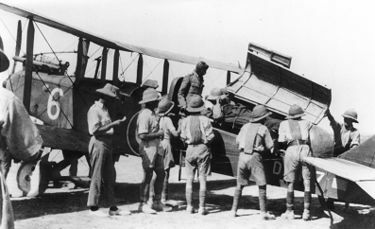 A fixed-wing aircraft was first officially used as an air ambulance in 1917 in Turkey, when an injured British soldier was transported from the battlefield to the nearest medical facility. The hospital was located three days away by road, but the patient arrived in 45 minutes by air, reportedly saving his life. French records at the time indicated that, if casualties could be evacuated by air within six hours of injury, the mortality rate among the wounded would fall from 60 percent to less than ten percent. The United States, in gearing up for entry into WWI, developed numerous new flying fields. These fields were established in areas of the country with poor roads, and it was often a matter of several hours before a student pilot injured in a crash could be brought to a hospital. Flight Surgeons rapidly began to develop air ambulance conversions of the JN-4 "Jenny" training aircraft, and by 1919 such ambulances were a fixture on all training fields. By the end of WWI, air ambulances were in common use in the United States and had seen limited combat use in France. No other nation actually used air evacuation, though the United Kingdom had experimented with it before the war. However, neither medical systems nor the airframes themselves were able to allow in-flight medical care. Though built in numerous versions, each of these early air ambulances had one common feature—the patient was enclosed in the fuselage, without an attendant, and with no possibility for care in flight. In this regard, they were the model for most air ambulances during this period. Even though the air ambulance was a reality, it was seen only as a means of transport, rather than as an integrated part of the medical care system. Although air ambulances were certainly in increasing use following WWI, there did not appear to be any great need for systematic air evacuation on a large scale during peacetime. Most nations paid little attention to the issue, though military air evacuation systems were developed by France and Britain for use in their colonial wars and successfully evacuated thousands of casualties. For the first time, there was an effort to provide some limited in-flight care, and one Breguet XIV-b Limousine was described as having "electric boilers, coverlets, tank of oxygen, surgical instruments, and dressings." For the first time, aircraft were integrated into the military medical system, even though still under command of non-medical officers. The benefits were clearly recognized, but unfortunately the systemic changes needed in military medical establishments to make optimum use of this new modality were not adopted by most nations. Beginning in 1920, the U.S. Army developed an ambulance modification of the De Havilland DH-4, which was produced in significant numbers, and several of which were used extensively on the Mexican border. Just as had been the case with earlier air ambulances, these planes carried their patients isolated in coffin-like enclosures built into the fuselage. With WW1 planes having so little capacity to carry any significant number of wounded, and the risk of transporting the wounded, it seems to me it might be more effective to bring the Doctor and his supplies to the patients, rather than bring patients to the Doctor.